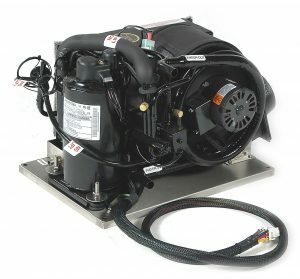 With a cooling capacity of 550 cubic feet, this unit is designed to cool/heat cruisers up to 27′ and up to 30′ sailboats. 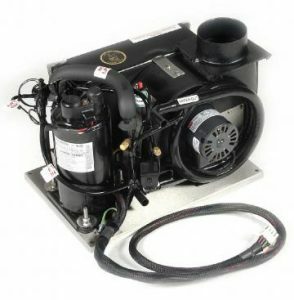 This unit is available in right, left or top air discharge configurations, and is now available as a cool reverse cycle heat unit. We use 4″ ducting and recommend a minimum of 2, 4″ round supply grills with this installation. More is always better! This unit will run off the new Honda EU1000i 1,000 watt portable generator, while in cool mode. 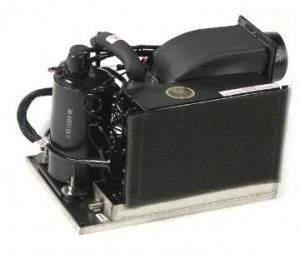 Another option is to use a Statpower 1,000 Watt Inverter and 450 amp hours of battery power and you can anchor out (on average) for one night. The electric heat option generates 5,640 BTU of heat. Electric heat option is not available in 220/240 Volt configurations.